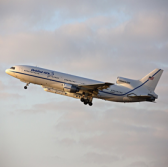 Northrop Grumman and NASA are likely to launch the agency’s Ionospheric Connection Explorer satellite aboard the Pegasus XL rocket later this year from Cape Canaveral Air Force Station in Florida, Spaceflight Now reported Thursday. Officials who have knowledge of the mission said the launch of the ICON satellite designed to explore the connection between weather and space conditions is expected to move to Cape Canaveral after Northrop decided to postpone the mission of the Orbital ATK-built rocket. Orbital ATK now operates as Northrop Grumman Innovation Systems after its acquisition by Northrop in June. The rocket that would be air-dropped from the L-1011 carrier aircraft was originally scheduled to take off on June 14 from Kwajalein Atoll in the Marshall Islands but Northrop observed unusual telemetry data during the June 6 ferry flight of the rocket to the island from Vandenberg Air Force Base in California. Tim Dunn, a launch director from NASA’s Launch Services Program at Kennedy Space Center in Florida, said the agency and Northrop would assess their options prior to making a decision on the new launch site and window.